Special for diabetics: Tomato Omelette Recipe! A delicious omelette with the combination of tomatoes. Try this recipe and share your feedback with us! Chop tomato, onion and green chilies very fine. Put chopped stuff into a bowl. Add carom seeds, cumin powder, turmeric powder, ginger paste, kasoori methi and salt to taste. Then add besan. Mix well. Then add approximately 1 cup of water and mix everything really well. 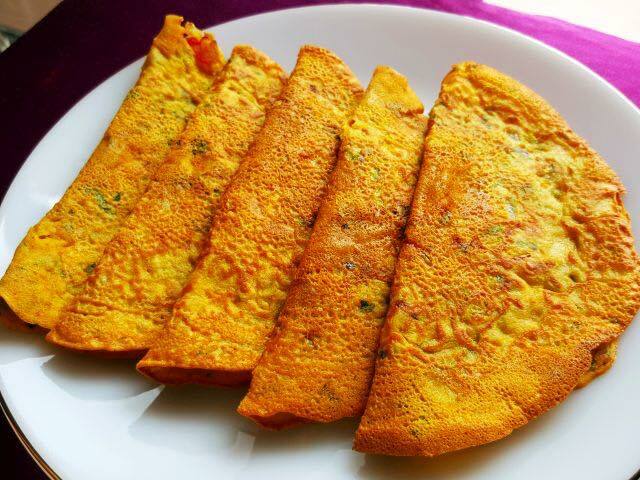 If you want thin and crispy omelettes, keep the batter little bit thin but not very runny. If you prefer thick omelette, then add less water. Cover and let it rest on a counter for 15 mins. Heat pan on medium heat. Once heated, spread 1-2 tsp of oil all over the pan. Pour 1-2 ladleful of batter and spread it evenly.Cover and cook for 2-3 mins. The upper side will get cooked because of the steam. Flip and cook uncovered from other side for a min or so.Take out in a dish and serve hot with green chutney.